Joe Cada’s victory last night in Event No. 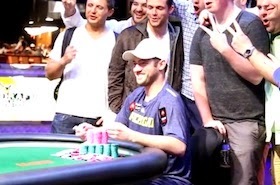 32, the $10,000 Six-Handed No-Limit Hold’em Championship, marked the first time one of the last 12 WSOP Main Event winners -- dating back to 2002 champ Robert Varkonyi -- has been able to follow his ME title with another WSOP bracelet win. Carlos Mortensen was the most recent champion to follow his ME title with a win in another bracelet event, having won his second (and so far only other) WSOP bracelet in 2003 in a $5K limit hold’em event. There hasn’t been as good a year for former ME winners at the WSOP since, not by a long shot. Chan and Brunson would each win bracelets in 2005 -- the last for both. Scotty Nguyen would win the $50K H.O.R.S.E. in 2008. And Phil Hellmuth won WSOP events in 2006, 2007, and 2012, while also winning the 2012 WSOP Europe Main Event. The period since 2003 has seen fields expand dramatically, although the number of bracelet events has essentially doubled, too, since 2003. And while there have been a lot of ME winners playing a lot of events, getting all of the way back to the winner’s circle has proven difficult for nearly all of them. Cada was a likely candidate to break through to get that second bracelet, having come close several times recently with two fourth-place finishes last year and a runner-up in 2012. Greg Merson has cashed three times already this WSOP and seems capable of being the next WSOP ME winner to win a bracelet. I’d say Jonathan Duhamel probably would be a good choice, too, to win one, even though he’s off to a rough start at this summer’s Series. Then again, Hellmuth is 11th of 38 in another event to start today (Event No. 36, $1,500 NL 2-7 Draw), and so perhaps he’ll be the next ME winner to grab more gold. Again.